First, log in to Shopify and click on Online Store (under sales channels). Next, click the Customize Theme button. 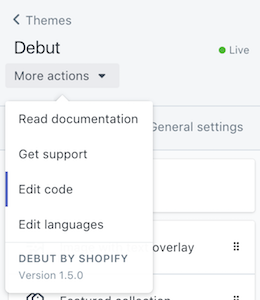 From here, click on the More actions drop down and then Edit code. Now you can select the .liquid file that you'd like to insert your Hive widget embed into, which will dictate where the widget appears on the page. You can insert it into index.liquid to start. Once you've decided which file you're going to edit, insert the Hive embed code found in your Hive.co dashboard when you click share this Signup Form, Contest, or Download. Once you've inserted your code, click Save. Take a look at your Shopify store to make sure you're happy with the placement and appearance of the embed!